Best Greg Amundson's time of 3:59 for this workout ("Fran") and win a T-shirt! "Thrusters" are rock bottom front squat/push-press combo. Pull-ups are from full extension to Adam's Apple touching bar. Post time to comments. The development of presses to handstand, holds, and pirouettes on parallettes are essential to the CrossFit concept. 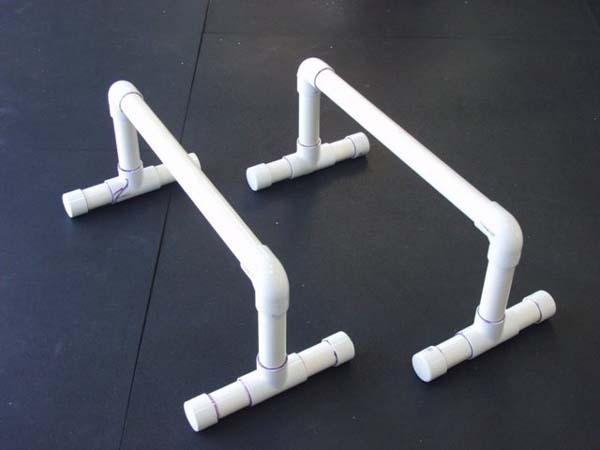 You need to make or buy parallettes. Today's workout ("Fran") and detailed plans for these parallettes are featured in the September 2003 CrossFit Journal.